Construction, civil engineering, pipe fitting, DIY work. Horizontal, vertical, and 45 deg measurement., Construction, civil engineering, pipe fitting, DIY work. Horizontal, vertical, and 45 deg measurement. 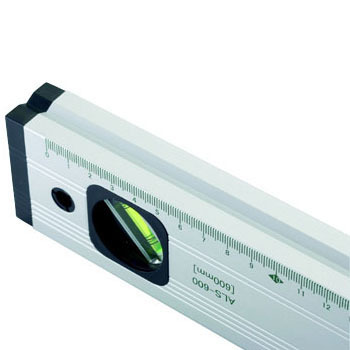 Magnetic Torpedo Level, "Blue Level PRO"
Because V-groove is attached, it is easy to use on the R side. It is thicker than those of other companies so it is stable. Slightly more bubbles than others, because it is easy to become two or three bubbles it is troublesome to make one. The movement of bubbles etc is solely a satisfactory level. This review is about item#58103552. The new bubbles are easy to see because it is new. This review is about item#58103577.